A Safety Stand-Down is a voluntary event for employers to talk directly to employees about safety. Any workplace can hold a stand-down by taking a break to focus on fall hazards and reinforcing the importance of fall prevention through talks, demonstrations, and training. 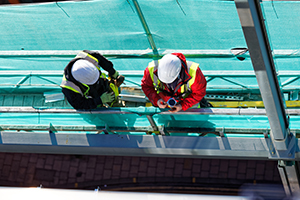 Companies with workers not exposed to fall hazards can use this time to have a conversation about the other job hazards they face, accident prevention, and the company’s safety policies and goals. It can also be an opportunity for workers to talk to management about job hazards that they see. Since its beginning, over 7.5 million people across the nation have participated in the National Safety Stand-Down. The event is a combined effort by the Occupational Safety and Health Administration (OSHA), the National Institute for Occupational Safety and Health (NIOSH), and the Center for Construction Research and Training (CPWR).